Please note: This item may currently have a build time of approx 1-3 weeks before it goes out. You can still purchase it now and it will go out as soon as it is ready. If you would like an updated time estimate, please contact us before you purchase. 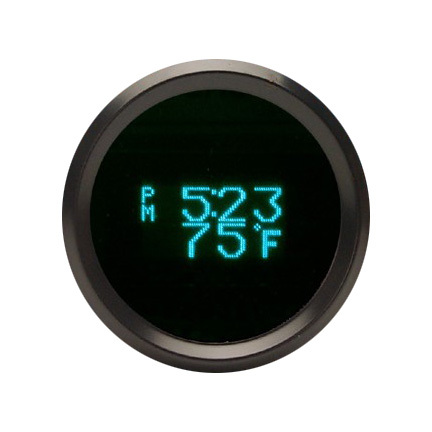 This listing is for one ODYR-16-1 Odyssey Series II Digital Clock Gauge from Dakota Digital, with either CHROME or BLACK bezel. Dakota Digital Odyssey Series II instruments offer a high brightness, non-glare vacuum fluorescent display for excellent daytime visibility and a lifetime of trouble free use. Odyssey Series II instruments are fully backed by a Limited 24-month Warranty against manufacturer defects and provide the accuracy and performance you've come to expect from Dakota Digital! Displays more than the time of day. Includes date and day of week readouts plus outside air temp in addition to 12 hour format clock. Choice of either Black or Chrome bezel. ODYR-16-1 has a 2-1/16" diameter housing. Don't forget: When making your payment, be sure to specify which bezel you want: black or chrome. This listing is for an ODYSSEY Series II gauge, with TEAL display. You can choose whether you would like the black or chrome bezel. Also available in a separate listing is the Solarix series gauge with BLUE display, with a black or chrome bezel.